My greatest project is still a work in progress, an almost 14 year old work in progress. Sometimes this project annoys me to no end, but most of the time, the project brings me the utmost joy and satisfaction. You may have guessed already that I'm talking about my wonderful daughter. I look at her and want to get down on my hands and knees and thank the gods and godesses that I am not a 13 year old girl! While I'm down there, I also give thanks that my life was blessed with this incredible, happy, healthy child. My little project has a new project of her own. Won't you please visit her new blog? She's just getting started and just learning. Blogger Beta isn't being terribly kind either. Please stop by for a visit and leave a comment just to say hi. I'm sure she'd appreciate it. I've completed several projects recently and need to take and post some photos. First up, the dreaded black shrug was finished. Let me just say that the pattern was a horror! It was written with a cast on of 30 stitches for ribbing the first sleeve. On the other sleeve (after working across the back and down the second sleeve) the author had you decrease to 44 stitches for the cuff ribbing. Um....does anyone else see a problem with having almost 50% more stitches on that second cuff?? I decreased to 30 stitches for that sleeve, thank you very much. That was just one of my many complaints about the pattern. Yes, it was a freebie, but it certainly is not up to par with many of the wonderful, well-written free patterns out there. I've also finished a ribbed hat using my own handspun yarn. I'm really quite pleased with it and feel that it's the most attractive thing I've made to date with my own yarn. Last night, I completed a hat using a pattern from Susan's blog. No, I'm not stalking her! Start with the archives from November 21, 2005. 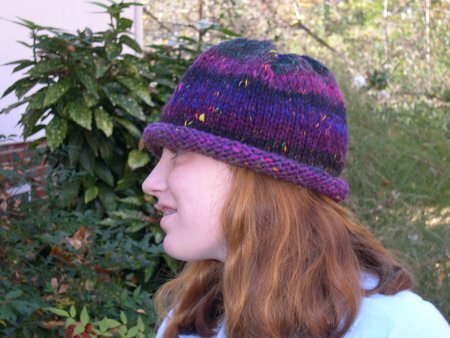 This is a free pattern that Susan shares over the course of several postings. This is one of those well-written patterns I was talking about earlier! I used one skein of Patons SWS yarn for my hat. This was my first time using it, and I'm not sure what I think. The colors of the yarn are gorgeous. It's also very soft--looks kind of like a single strand with a very low twist. I was afraid that the yarn was going to break at some points, because it didn't seem to have any twist to it, but it must be stronger than I thought. I didn't like the fact that the yarn seems to fuzz a bit while you are working with it. That's especially true if you need to frog. I'm wondering if my hat is going to pill? One skein of yarn made a nice sized hat (and I have a big head!) even with the yarn eating i-cord cast off. That cast off is so attractive that it is worth the extra yarn. We had a great, quiet Thanksgiving. That's the perfect kind, if you ask me. I had lunch on the table by noon thanks to the cooking assistance of daughter. We had most everything prepared on Wednesday, so Thursday was a breeze. I decided to venture out for some shopping today and was pleasantly surprised to find the stores not too crowded. I'm not nuts enough to go out before daylight, but I was in Wal Mart by 8:30. They had what I was there to buy, and I didn't have to wait in line to pay. I even found a close parking space. You can't beat that. This boosted my courage enough to venture into the "big city" for some mall shopping. We stopped off at Target first to procure down blankets for my grandmothers and a toy for my "nephew." Again, I didn't have to wait in line and I got a decent parking space. The mall was a bit more crowded, but once I figured out that parking near one of the department store entrances was out, I found a place to park. Macy's helped me finish up most of my shopping. We were out of the mall by 1 PM, I think. We'll soon be baking cookies for daughter to give to her friends. That should be fun. I found a recipe in the current Good Housekeeping for chocolate filled biscotti. I think a batch of that and maybe one other kind of cookied should do us. In continuing my lemming like ways, I'm following the crowd that are posting thankful topics this week. I'm thankful to be done with my first lace shawl. I've never created something as beautiful as this. I'm very thankful to Susan for writing the pattern and to Carolyn for letting me know it was out there. I'm thankful that daughter finished one of her hats. This one is made of some sort of expensive bulky Noro. I can't remember what the specific yarn is, but isn't the hat lovely? The girl's not so bad either. I'm thankful for a job that pays the bills and supports my fiber addiction, even if I don't always like the job. I'm thankful for our home. It truly is our safe haven from the mad and crazy world. I'm thankful to be married to my best friend. We've known each other for over 23 years and been married almost 19 years. That's quite an accomplishment. 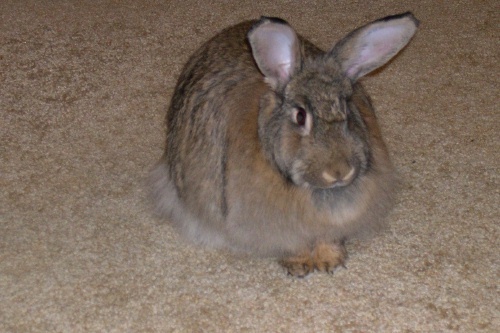 I'm doubly happy that he also knits and spins, so he understands why there is so much yarn and fiber in the house. I'm thankful to have a healthy, happy young woman for a daughter. She's the most important part of my life and I love her more than life itself. 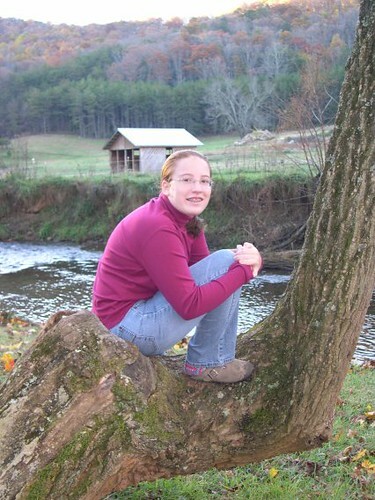 MLE, you are the best, and I'm proud to be your mom. OK. Enough mush. I'm starting to tear up, and we can't have crying. I'm currently working on a black shrug for daughter. I'm using bulky weight Encore and a pattern found on line. The pattern is called Chocolate Shrug. It's knit flat, and I'm going to re-write the pattern for a different weight yarn and knit primarily in the round. I just can't see the sense of seaming if I don't have to. Just wish I'd come to that conclusion about 20 inches ago! The shrug is turning out nicely, I think. Pictures will come when it's done and I have a model. I bought some Patons SWS to make myself more slippers. I need a pair and a spare for when one is in the wash. Husband still has his Fuzzy Feet to felt. Maybe we'll get around to that this weekend. We went to Peachtree Guild meeting on Sunday and had a good time. There were so many people there--so many spinners. The drive isn't fun (about 2 hours) but it's worth it to spend time with people we enjoy. We are home this weekend for Thanksgiving--just the three of us, which is our tradition. Today is my last day of work for the week and daughter's last day of school. We'll do most of our cooking tomorrow. I'm looking forward to eating yummies. We always have the same menu. That's tradition, too. One stitch. It doesn't seem like a lot...just one tiny little stitch. That's all it takes to throw off a lace pattern, though, and it's kind of hard in my limited lace knitting experience to fix that kind of error. Fix it I did, though, and my Forest Canopy is now well on her way to being completed. There is also now a life line neatly tucked into place. Later today, I need to knit the border and then do the bind off and there you go. I'll try to take a picture. I did promise photos at some point this week. Here's a little tip for those of you using KnitPicks Options needles or Boye Needlemaster. See that tiny little hole in the needle where you are supposed to tighten the join between the cable and needle tip with the key supplied in your needle set? Did you know that if you thread a piece of fine yarn or dental floss through that hole, you can very easily knit in a life line? The line doesn't get tangled into your stitches but glides along with the needle cable. Try it! See the title of this post? That's what happens when you get cocky! I thought I could whip out my Forest Canopy Shawl this week, but it has other ideas, it seems. I've spent more time tinking that knitting. Grr... No, I did not take Susan's advice and use a lifeline. Cocky self. That'll teach me. *sigh* I won't give up! None of us really feel like going out anywhere today, so we're holding our own family fiber "guild" meeting. I have a peach cobbler ready to go in the oven and coffee ready to brew, so there are our treats. We each have projects ready to work on. Husband has discovered Lady Eleanor (from Scarf Style--just google it) but deemed the Silk Garden too expensive. He's working on a fibery blend to spin up to make yarn for his own version of the lovely Lady. The bats were soft beyond belief, so I feel sure his yarn will be glorious. Daughter has two hats that require just a little more effort to be finished. She's procrastinating, though. Since one hat involves a very pricy skein of MY Noro yarn and the other is a Christmas gift that must be finished no later than mid-December, we've given her a mandate--finish the two hats before we'll even consider shopping for HER Christmas presents. Sometimes you gotta hit 'em where it hurts! 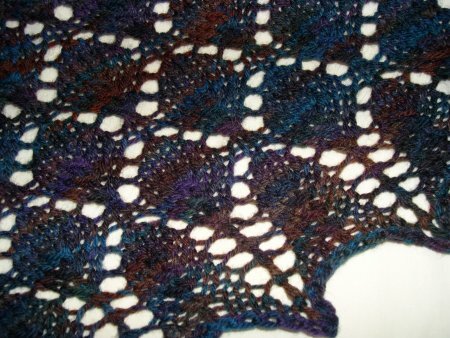 I am obsessed with the Forest Canopy Shoulder Shawl since seeing Carolyn mention it on her blog. I started mine last night. It just happened that some of the pattern specified Mountain Colors Weavers Wool was lurking in my stash, so that's what I'm using. The pattern is super simple and works up quickly. I'm using the color Marias Falls which the company describes as having Deep Blue with Purple, Warm Brown, Chocolate, and Dark Green. It is gorgeous!! I will be knitting on this at our family fiber meeting today. My first yarn spun on my new Lendrum is drying as we speak. It turned out very well. Husband is impressed, I think, and that means a lot to me. My yarn is destined to become a hat and then we'll see how much is left before planning the next project. I've been collecting up my odds and ends of wool to make a Kitty Pi bed for Mocha and Socks. Mocha loves cuddling up with my felted slippers, so I imagine he'd enjoy his own felted bed, too. I'll post pictures of all this and more later in the week. Yesterday was a day for rides. We test drove a new ride--the Honda Pilot. It was really nice, and probably in my future within the next year or so. Once you go SUV, you don't go back. I just cannot imagine driving a car again after having had something bigger. Last night, we tried out some different rides at the fair. We've not been to the fair in many years, and daughter was practically begging to go with some of her school friends. No way are we turning a 13 year old loose at a fair, so we became the designated chaperones. I was pleased to see that this fair was cleaner and better maintained than fairs I remember. It was in the "rich" county nearby, so perhaps that had something to do with it? Husband and I ended up acting like kids ourselves and enjoyed a couple of spins on the Sizzler and the Himalaya. We were headed for the Ferris Wheel when a certain 13 year old swiped our last tickets. There's always next year! Webster's defines a lemming as any of various small short-tailed furry-footed rodents that are notable for population fluctuations and recurrent mass migrations. At least they are cute! I'm following the Lendrum Lemming group. My Lendrum arrived yesterday. Husband helped me get it set up last night, and I've moved it into my office. There's nothing like spinning or knitting during a long, boring conference call! I've spun a little bit on my Lendrum so far, and it's a different feel from my Schacht, for sure. I always spin on my Schacht with it set to double drive, and the Scotch tension on the Lendrum has a different feel. The treadling also feels different on the two wheels. That's not a problem, just something to get used to when going from one to the other. Hey, DeltaDawn, I think we must have sister Lendrums! I spent the weekend doing a whole lotta nothing. It was nice. Yesterday, I cast on for the Little Coco bag for myself. It is knitting up quickly. I'm using a dark green and a medium green for my bag--dark green for the bottom and trim. I could potentially finish it off tonight if I'm industrious. I'm heading out on a business trip tomorrow, though, so I may not be that industrious tonight. We watched two good movies this weekend. First up was The Lake House with Keanu Reeves and Sandra Bullock. This is one of those "just let go and enjoy" kind of movies. Don't try to figure it out! Last night, we accidentally watched Casanova with Heath Ledger and probably some other people. Honestly, I didn't notice a soul except Heath! Are you wondering how one watches a movie by accident? Well, husband was playing with the satellite TV remote looking at the pay per view movies. He meant to just get info on this one but somehow it ended up purchased! I figured if we were going to pay the $4 for it, we may as well watch it. I believe I'll be getting a wheel delivery this week!!! That's exciting, eh? No matter how many wheels you own, it's always exciting to add a new one to the flock. Beverly asked about the hat pattern for my Noro hat. Here's a link to the e-bay listing for that pattern. Miss Phoebe Licious came in to play this morning. She certainly seemed to enjoy hopping around the den,sniffing everything in site, and getting lots of love and attention. I've been wanting to make daughter a new hat to go with her fall coat. Here's a little something I whipped up last night. It took me about 2 hours and used one ball of Noro Silk Garden. The color is 234, and it incorporates several nice, feminine shades. The hat is so soft since it's been washed. The pattern is one I purchased off of e-bay a couple of years back. The seller is Shelley Mackie out of British Columbia. Here's a link to her website. I'm not sure if she is still selling these patterns. 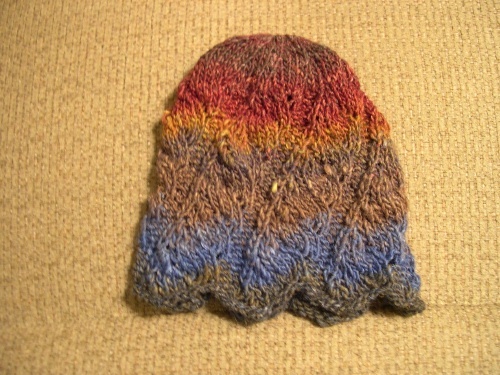 It is called "Six Hats in Noro Yarn" and each pattern is designed to use just one ball of Silk Garden or Kureyon. Another soft thing in my life is my new Fuzzyfeet. No, I've never been impressed with the pattern or my results in three attempts at using it. Every pair of slippers has seemed quite narrow after felting. However, my new red slippers were so soft and pretty that I have been wearing them the past two days now in spite of taht little pinch. They are gloriously warm, and they've stretched out to fit quite nicely. Given this stretching bit, I'll likely make this pattern again....with some modifications. I'd like a slightly tighter fitting, taller cuff. I've been drop spindling quite a bit lately but don't have any pictures to share at the moment. I've had an ounce of Tussah silk in my stash for over a year now and have finally worked up the courage to spin it. I'm surprised at how easy it is to spin silk. If I'd only known, I may have stocked up on quite a bit more at SAFF! My next silk project is tackling one of my hankies. Someone pointed out to me some good directions on Knitty for spinning hankies, so I've printed them out to read. Husband has been experimenting with his spinning techniques recently and is getting fabulous results. I'm not clear on what he's doing--something about twist angle. He has been combining long draw technique along with the twist angle information and is getting some wonderfully soft yarn as a result. I'll try to get some photos of his yarn later. We made a trip to Knit Together yesterday in search of some Cascade 220 for a couple of purses I want to make. I am planning to make the Little Coco Bag for my brother's girlfriend as a Christmas gift. I made her a felted purse a couple of years ago, and she loves it! I am also going to make myself one of these purses and get husband to help me needle felt something on it. I heard the weather was supposed to cool off here this weekend, so of course I started thinking about keeping my feet warm. When my feet get cold, I'm just miserable. Felted slippers are great at keeping feet warm, so I decided to give Fuzzyfeet one last try. This is not a pattern I particularly like. I don't find it to be very well written, and I've not had success with it turning out consistently in the past. I was pleasantly surprised this time with my slippers (third time is the charm, eh? ), but I'm still not impressed with the pattern as a whole. Many people think this is a great beginning sock knitter pattern, but if I'd not had previous sock knitting experience, I'd not have understand a few sections of the pattern instructions. I will say this about Fuzzyfeet--they work up fast. How can they not with Lamb's Pride and size 10.5 needles? 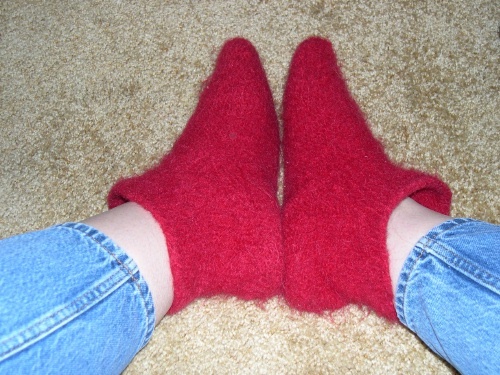 I finished off the knitting in about 4 hours total, felted the slippers last night, and have them drying today. I should be wearing them tonight. I'll try to get a photo for you--they are in the color Blue Blood Red or something like that. It's one of my favorite Lamb's Pride colors. I am now impatiently waiting for an order from The Woolery!! Yep....a new wheel is rolling my way. That means we are going to be selling the Kromski, most likely. Gotta make room for the newbies! Yes, I still have SAFF related photos! Here's an example of what I enjoyed best about SAFF--friends! 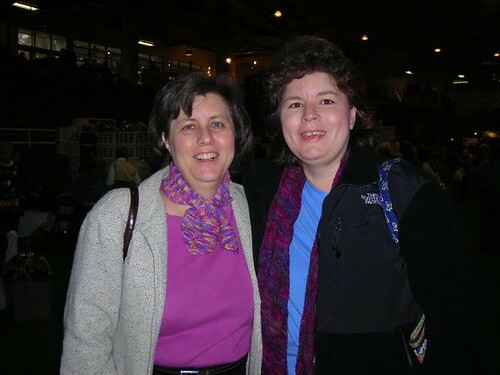 I don't have photos of every friend, but here is one of Carolyn and me. We loved staying in the cabin this year. Here are some shots of the inside. First, the loft. This was daughter's domain. It had two beds, so she got her pick. 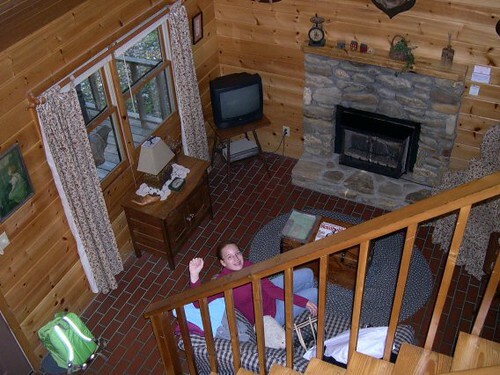 Here's a view of the downstairs taken from the loft. Notice the brick floor. It was very chilly in the mornings. 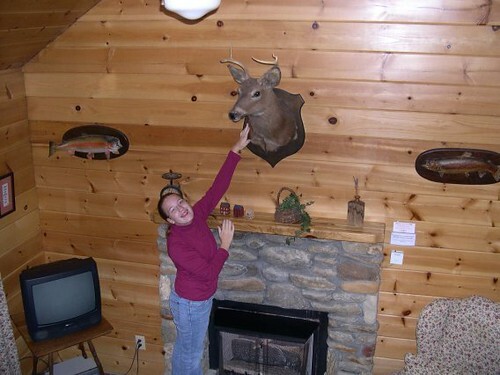 The gas logs in the fireplace helped that little problem, though. Behind the living area is a dining/kitchen area. There are also two bedrooms and a bathroom downstairs. 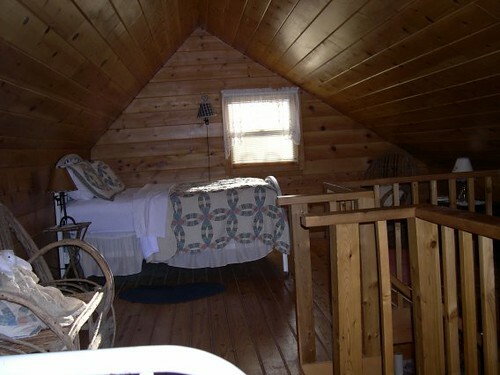 Here is one of the bedrooms. 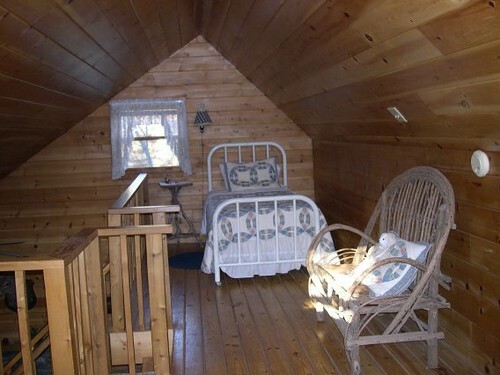 The entire cabin is furnished with antiques and unusual odds and ends. Notice daughter making friends here with one such oddity. 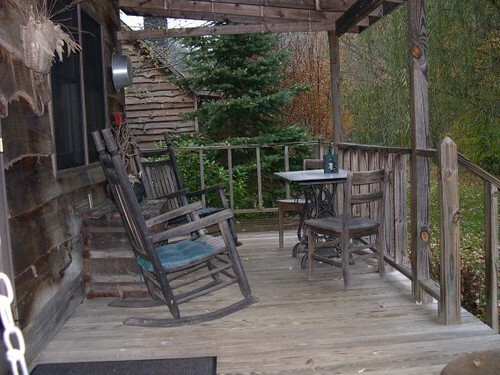 The grounds around the cabins are beautifully kept. The natural beauty of the area of course plays a huge part in that. 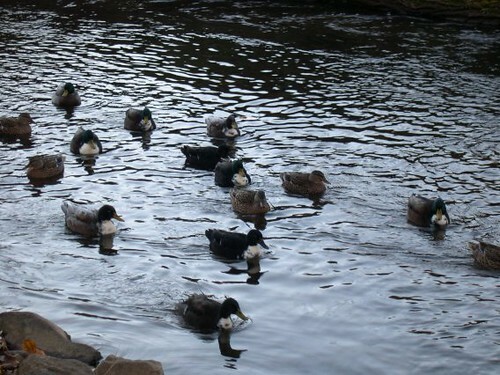 These ducks enjoy swimming in the creek on the property. There are chairs, hammocks, and benches all around the place so that visitors can sit a spell and enjoy themselves. 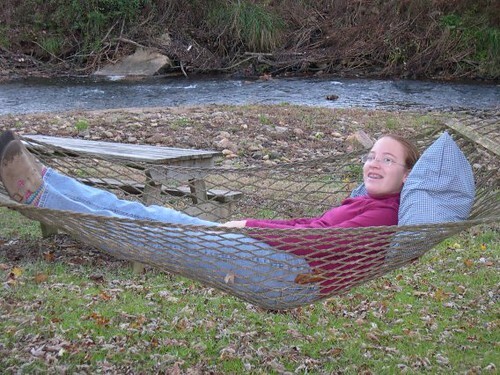 In spite of the rain, daughter had to try out the hammock. Here's another photo of daughter enjoying herself. We decided against staying in a hotel for SAFF this year. 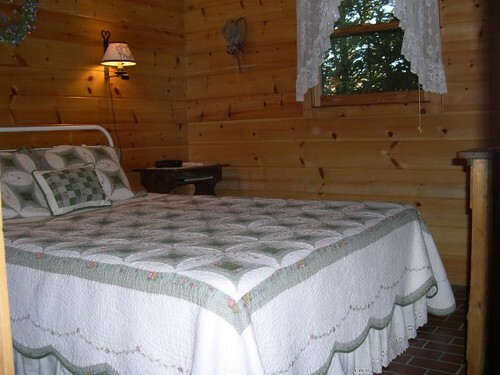 The cost of renting a cabin was comparable, and the privacy and room afforded by a cabin were much preferable to a tiny hotel room. 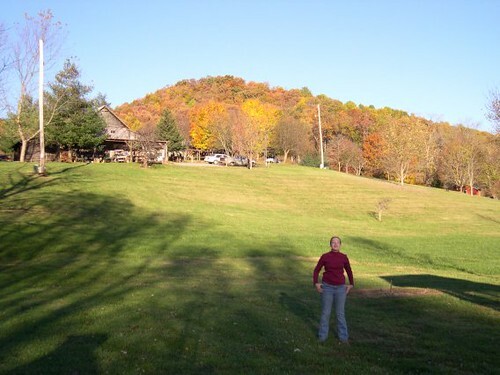 We enjoyed staying at Mountain Springs Cabins. They are located in West Asheville, and it took us a good 30 minutes to drive to SAFF. It was worth it, though. 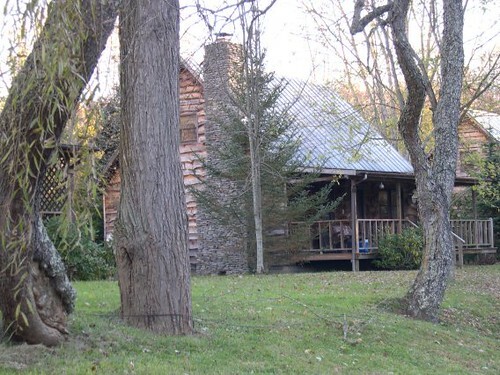 Here's what our cabin looked like. 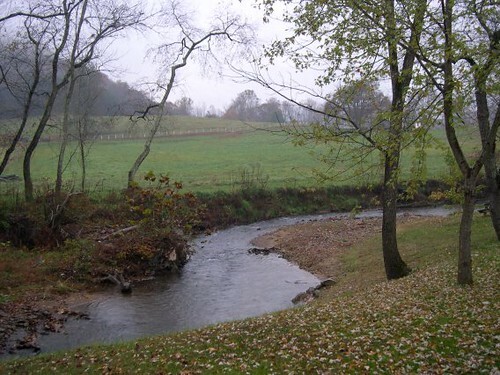 From the porch, we had a great view of a stream and meadow. The front view of mountains was beautiful, too. 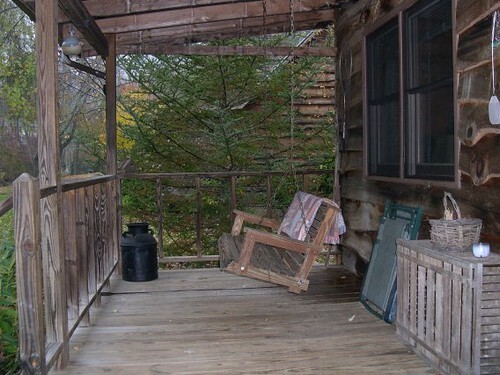 Had the weather been warmer, we would have enjoyed time relaxing on the porch.